to maximize the efficiency and effectiveness of their retail marketing operations. Successful commerce today is marked by multichannel, cross-channel and even omnichannel courses of action. Digitization in particular plays an essential role, is also becoming more and more important and is progressing at an incredible rate. It is a one-of-a-kind political, economic and social change that is (simply) revolutionizing markets, industries and companies and even very diverse parts of life - or would you have ever thought that you would allow the world to participate directly in your purchasing decisions through social networks? Have a look at our 4th retail Summit – Port of Thoughts and enjoy our event movie of this years event. 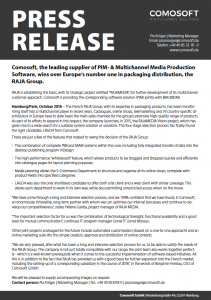 Comosoft, the leading supplier of PIM- & Multichannel Media Production Software, wins over Europe‘s number one in packaging distribution, the RAJA Group. RAJA is establishing the basis, with its strategic project entitled “RAJAMEDIA“, for further development of its multichannel customer approach. Comosoft is providing the corresponding software solution (PIM) jointly with IBM (MDM). Hamburg/Paris, October 2016 – The French RAJA Group, with its expertise in packaging products, has been transforming itself into a multichannel player in recent years. Catalogues, online shops, telemarketing and 19 country-specific disctributors in Europe have to date been the main sales channels for the group‘s extensive high-quality range of products. As part of its efforts to expand in this respect, the company launched, in 2015, the RAJAMEDIA Vision project, which has given rise to a wide search for a suitable system solution or solutions. The four-stage selection process has finally found the right candidate: LAGO4 from Comosoft. The combination of complete PIM and MAM systems within the core, including fully integrated transfer of data into the desktop publishing program InDesign. The high-performance “whiteboard“ feature, which allows products to be dragged and dropped quickly and efficiently into catalogue pages for layout planning purposes. LAGO4 was also the only shortlisted candidate to offer both a fat client and a web client with similar coverage. This allows each department to work in its own way, while also permitting unrestricted access when on the move. “We have come through a long and intensive selection process, and are 100% confident that we have found, in Comosoft, an enormously innovative, long-term partner with whom we can optimise our internal processes and continue to develop our competitiveness“, states Hélène Gariba, project manager of RAJA MEDIA. “The important selection factor for us was the combination of technological foresight, functional availability and a good basis for mutual communication“, continues IT program manager Lionel IT Lionel Moraux. Other joint projects envisaged for the future include automated customisation (based on a one-to-one approach) and an online marketing suite (for the simple creation, approval and distribution of online content). “We are very pleased, after what has been a long and intensive selection process for us, to be able to satisfy the needs of the RAJA Group. The company is not just totally compatible with our range; the joint team also works together perfectly - which is a well-known prerequisite when it comes to the successful implementation of software-based initiatives. All this is in addition to the fact that RAJA has provided us with a good basis for further expansion into the French market; including the setting-up of a corresponding subsidiary in the course of 2016“, in the words of Benjamin Ferreau, CEO of Comosoft GmbH. We will be pleased to supply accompanying images on request. 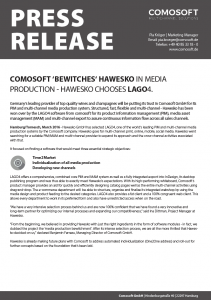 COMOSOFT ‘BEWITCHES‘ HAWESKO IN MEDIA PRODUCTION - HAWESKO CHOOSES LAGO4. Germany‘s leading provider of top quality wines and champagnes will be putting its trust in Comosoft GmbH for its PIM and multi-channel media production system. Structured, fast, flexible and multi-channel - Hawesko has been won over by the LAGO4 software from comosoft for its product information management (PIM), media asset management (MAM) and multi-channel export to assure continuous information flow across all sales channels. Hamburg/Tornesch, March 2016 - Hawesko GmbH has selected LAGO4, one of the world’s leading PIM and multi-channel media production systems by the Comosoft company. Hawesko goes for multi-channel: print, online, mobile, social media. Hawesko went searching for a suitable PIM/MAM and multi-channel provider to expand its approach and the cross-channel activities associated with that. LAGO4 offers a comprehensive, combined core PIM and MAM system as well as a fully integrated export into InDesign, its desktop publishing program and was thus able to exactly meet Hawesko’s expectations. With its high-performing whiteboard, Comosoft’s product manager provides an aid for quickly and efficiently designing catalog pages well as the entire multi-channel activities using drag-and-drop. The e-commerce department will be able to structure, organize and finalize its integrated webshop by using the media design and product feeding to the desired categories. LAGO4 also provides a fat client and a 100% congruent web client. This allows every department to work in its preferred form and also have unrestricted access when on the road. “We have a very intensive selection process behind us and are now 100% confident that we have found a very innovative and long-term partner for optimizing our internal processes and expanding our competitiveness,” said Ina Dittman, Project Manager at Hawesko. “From the beginning, we believed in providing Hawesko with just the right ingredients in the form of software modules - in fact, we dubbed the project the ‘media production bewitchment’. 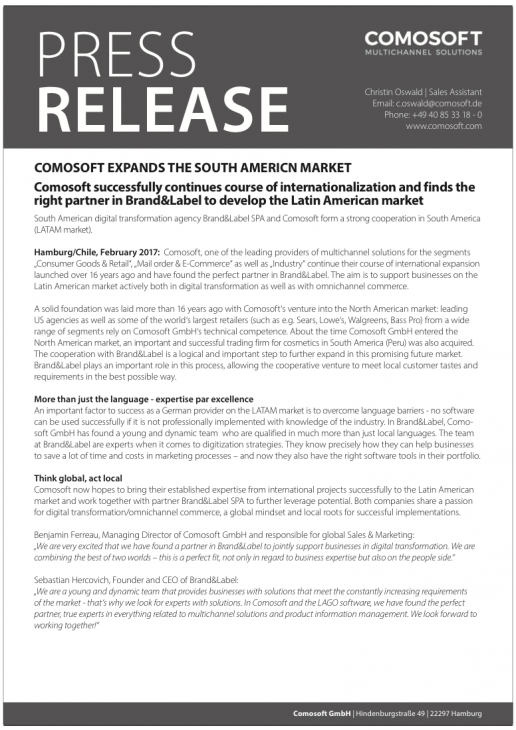 After its intense selection process, we are all the more thrilled that Hawesko decided on us,” declared Benjamin Ferreau, Managing Director of Comosoft GmbH. Hawesko is already making future plans with Comosoft to address automated individualization (One2One address) and roll-out for further concepts based on the foundation that’s been laid. Please contact the comosoft GmbH Press Office for more information.